I have not contributed anything lately to the pages of CleanTechnica.com. This is not due to idleness, illness, or writer’s block, but because I have been away down south visiting my youngest daughter, and new grandson. 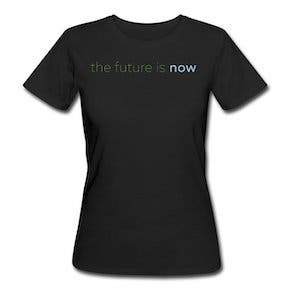 The joy at seeing a new generation coming into existence is tempered by the awareness that the ineptitude of the current generation, in failing to respond to climate change, might be stealing their future. Thankfully, the movement towards adopting electric vehicles is now picking up the pace. When I first started driving electric, about 3 years ago, when driving on longer journeys I had to share the chargers with a few Tesla drivers, or the occasional Leaf. 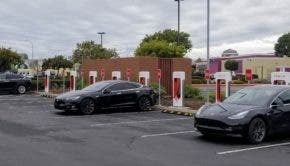 With the roll-out of Tesla supercharger stations in the UK, the Tesla drivers have migrated to their own charging area, and for a while, especially since charging ceased to be free, I seemed to have the chargers pretty much to myself. On my drive down south, however, it was very much a case of “spot the EV.” At Gloucester southbound services on the way down, a Hyundai Ioniq was just finishing at the chargers as I drove in. At Gloucester northbound services, on the way back, I parked next to a brand-new Jaguar I-Pace, and had a pleasant chat with the new owner, who seemed thrilled to bits with his first electric car. Nissan Leafs are to be seen very often. Where the Tesla charging stations used to be conspicuous by being brand new, and entirely empty, now there seems to be quite a number of Tesla cars all charging up at the same time. I am used to members of the public occasionally asking me a few questions about electric vehicles while I am charging up, but on the last occasion no fewer than 3 different people asked me to explain all about it. 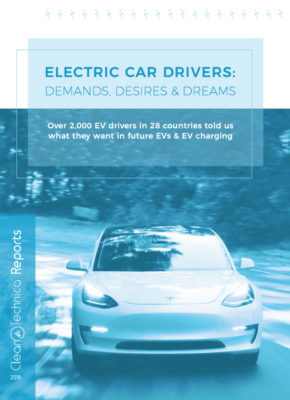 That is more than ever before on a single occasion, and seems a definite indication that the electric vehicle revolution is finally gathering momentum. Now I am back from my travels, and apart from my broadband connection failing, which I traced to a corroded wiring connector outside the house, I am now able to get back into a more normal routine. This includes lots of local trips in my electric vehicle. I was driving near to home a few days ago, when a van driver approached from a junction ahead to my left, did not seem to see me straight away, and ended up with the front end of his van poking out into the road. There was no real danger of a collision, and I just had to drive round him. I had a close view of his van, and written in large letters on the side of it, were the words, “Clear Vision.” Smaller lettering on the van made it clear that this was to do with his business of glazing and windows. It was the “Clear Vision” which remained in my mind, and the irony of a driver, apparently incapable of seeing my bright white electric vehicle coming towards him, and the “Clear Vision” written on his van, which made me chuckle to myself as I continued on my way. It just goes to show that you cannot always rely on the truth of the written word. There are many websites — and politicians — dedicated to telling people lies and fabrications, or what Sir Robert Armstrong famously referred to as being “economical with the truth” in the famous Sidney “Spy Catcher” trial. 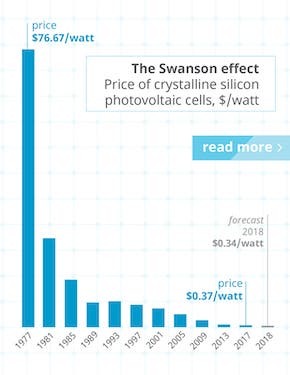 Here on CleanTechnica.com, we are dedicated to telling you the truth, not economically, but lavishly, at every opportunity, and about everything we think you should know about. Sometimes in the comments, our generous efforts are seemingly unappreciated by some, but we continue just the same. I often consider my writing an article to be like throwing a pebble into our communal pool of thought, where the comments are like the ripples flowing gently back. On some occasions it has been more like throwing a rock at the hornets nest, and having to run like hell from all the angry, buzzing projectiles coming my way. Communication is a risky business, but perhaps that is part of the fun. My project today is a fairly low risk venture, which might not even be particularly interesting or stimulating, but relatively safe, I hope. A while back, I got into a conversation in the CleanTechnica comments. The other person was lamenting the fact that the range of any electric vehicle is always given as an average. They were saying that they would mainly be driving about town, and so would want to know not the average range, but the sort of range they could expect to get when driving about town. 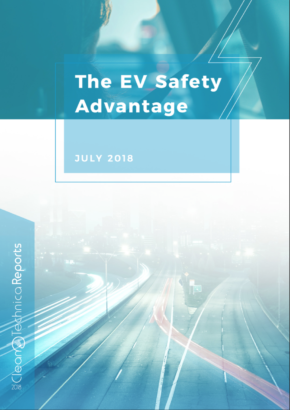 They were saying that prospective electric vehicle buyers should have the full information to help them with choosing which model and make to buy. Although the glossy advertising does not make this sort of information available, it is available on more technical sites such as the Environmental Protection Agency, and a site that I find very informative called the electric vehicle database, which has detailed information about many electric vehicles. Even then, there really is no single figure that can be quoted as the range of any electric vehicle. Some people, employing special driving techniques known as “hypermiling,” can get as much as 100% more range than expected. On the other hand, people driving their electric vehicle as if they were on the race track, with electric heating blasting away on a cold day, might only get 50% of the expected range. Cold temperatures reduce the range, and warm temperatures increase it. Strong headwinds can reduce range compared with driving in still air. Hilly terrain will tend to reduce range compared with driving on the flat. Constantly having to stop, start, slow down, and speed up will also reduce range compared to just driving continuously on a long straight road. Finally, driving like a bat out of hell will also considerably reduce your range. 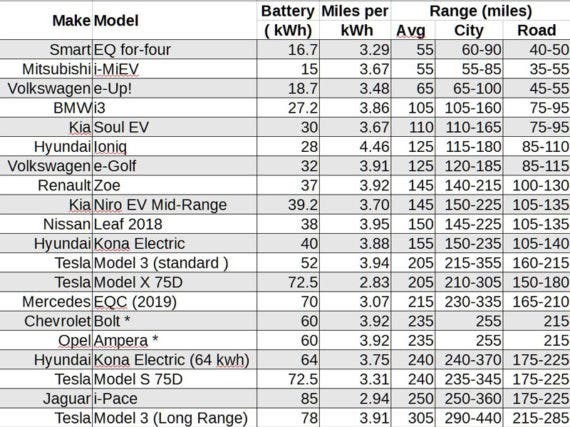 Whatever chart I produce with figures for range, I can be sure there will be people saying, “oh no I could get so much more than that out of my electric car,” and the best I can hope for is to quote figures worked out in the same way for each vehicle so that all the vehicles can be fairly compared. The Mitsubishi i-MiEV, for example, is given a top range of 55 miles on the road, where I get 70 miles on long trips. The best range for the Nissan Leaf is given as 135 miles on road trips where I got a best range of 200 miles, and even including driving in hilly terrain, I got an overall range of 185 miles. 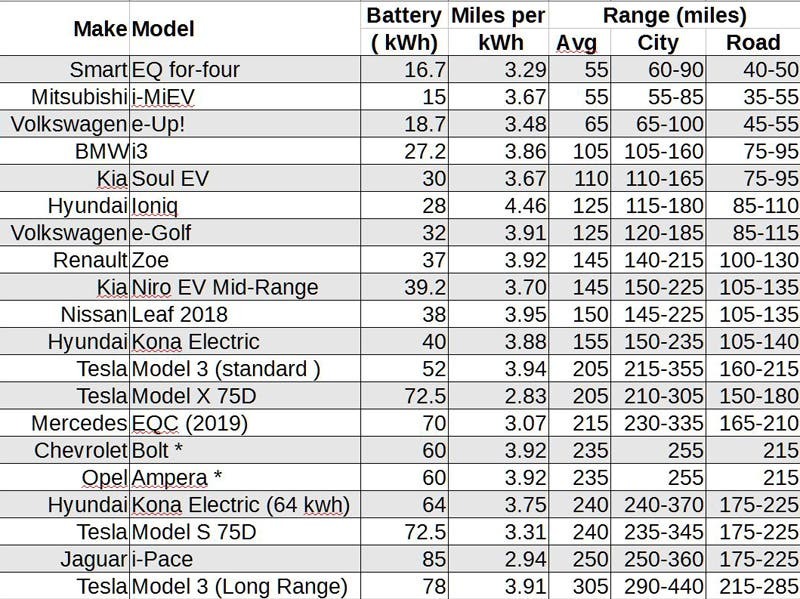 The following table provides a list of current electric vehicles with battery size, efficiency, average range, and a range of ranges in the city, and out on the open road. The range is between driving in sub-zero temperatures with heating on, and driving in the warm with no air conditioning. The range does not include any hypermiling. All of the vehicles listed can achieve longer ranges on road trips, if driven in the right way. * Opel Ampera is the EU version of the Chevy Bolt, and figures are taken from the EPA site, where a range of ranges is not available, just city and highway ranges. The Mitsubishi i-MiEV is not currently available, but is sold as Citroen C-Zero and Peugeot Ion. All figures for range are rounded to 0 or 5. Battery capacity is, where available, the usable capacity, not the full capacity. A rough conversion method for miles to kilometers is to add 50%, so 30 miles is roughly 45 kilometers. The precise conversion is multiply by 1.6, so 30 miles is 48 kilometers.